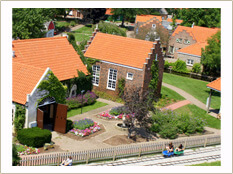 Welcome to the Blue Delft store of Nelis' Dutch Village in Holland, Michigan, U.S.A..
We import and sell thousands of items from the Netherlands, so call us if you can't find what you're looking for! Our specialty is the Dutch delft blue pottery (aka delft china). We stock delftware from many companies, in many different qualities, and have items to fit any budget, from souvenir-quality to Royal Delftware. We carry decorative tiles, birth plates and birth tiles, vases, canalhouses, and christmas ornaments, just to name a few. We also carry souvenir items, wooden bowls, wooden shoes, Dutch clogs, Dutch food, Precious Moments, and Custom Gift Baskets. Express U.P.S. shipping is available by request. Click for an estimated shipping time map. For non-personalized items, we generally ship ONE business day after receiving your order - we're fast!